The season of ice-cream, popsicles and gelato is on hand folks. Does that not get your taste buds excited! My favorite time of year is on the brink and I am so looking forward to the food it brings to the table. Fresh produce begins to be seen, your herbs growing in the window start to thrive. And the best food group in all the land is now “permit-table” to gobble up all day long: gelato. 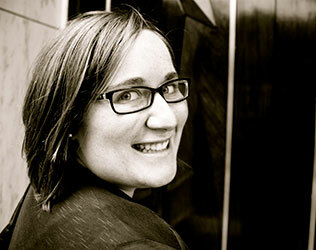 After I visited the gelato stands of Italy my snobby ice-cream critiquing was put to shame. I am an ice-cream connoisseur because it truly is my absolute favorite of desserts. The nutty, chocolatey, fruity, creamy treat is just one of my biggest weaknesses. However, gelato will always and forever trump ice-cream for me now. Maybe it is just the name that makes it more exciting to eat, or maybe it takes me back to cobblestone streets and street performers. Gelato is a spring/summer treat that you will not want to miss out on. And the great thing is you don’t have to go all the way to Italy to get it (even though that is the best setting by far to enjoy it). There are gelato shops in the US now and even in the super markets. 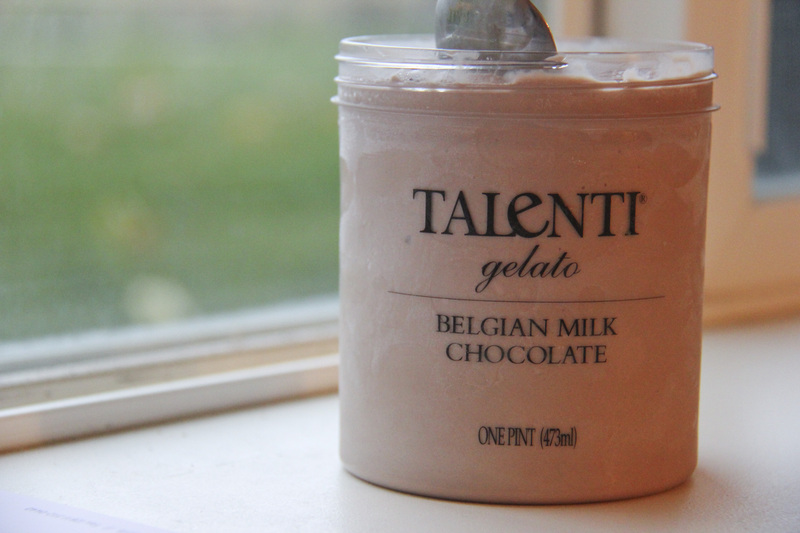 I have discovered my very favorite brand of gelato ever: Talenti! When I discovered it was sold in most all of the supermarkets near my home I knew I was in for trouble. My husband and I love to try a new kind each time we buy one and have discovered some phenomenal flavors. Gelato always seems to have really interesting flavor combos that you don’t find in normal ice-creams. They have more fruits, more nuts and just seem fancier with every bite. One that I loved in Italy was hazelnut. I loved it a little too much I think! But a close second was the pistachio gelato. Pistachio gelato is phenomenal. It is sweet, has a complex flavor full of roasted salty nuttiness, is amazingly smooth and creamy, and is just as addicting as the nuts used in the making. Why are pistachios so fun and delicious to eat? I have no idea, but they are no less wonderful swimming in creamy sweetness either. This great recipe is a hit on Pinterest and will be a hit in your home! 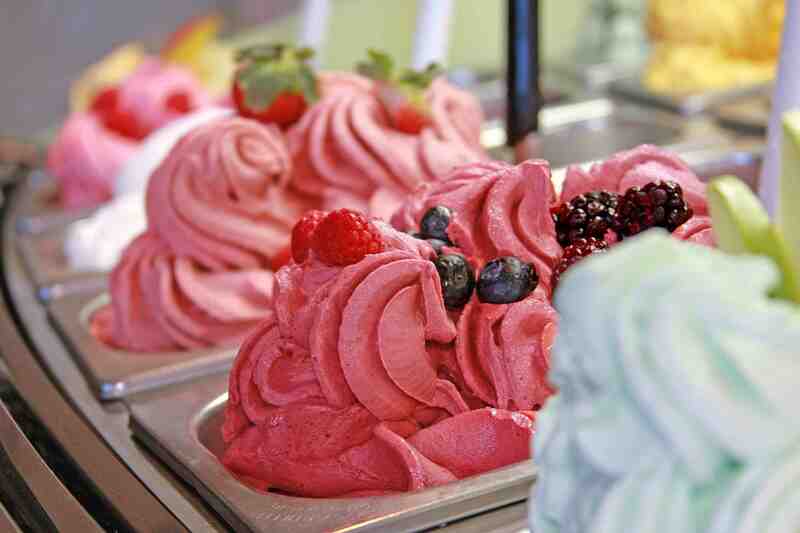 Have you ever ventured to make homemade ice-cream or gelato? It is such a fun process. 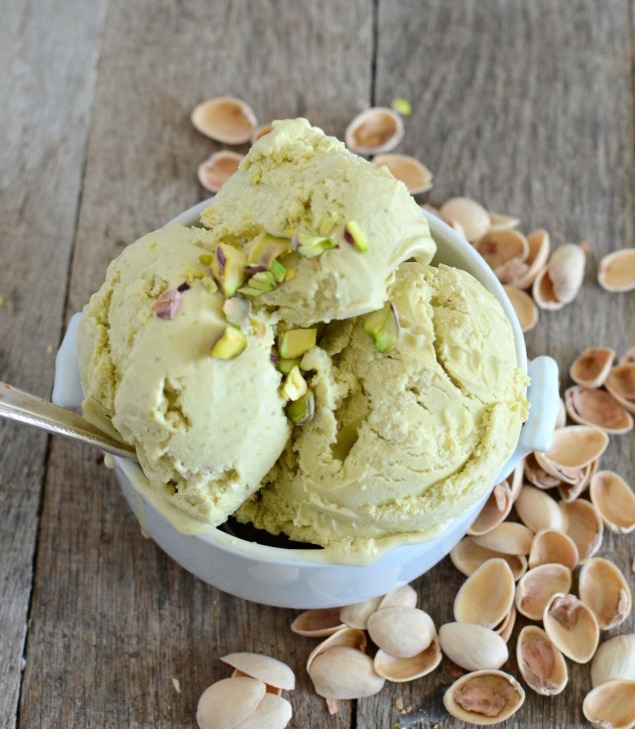 When you make this Gelato plan on having double the pistachios that the recipes calls for on hand because I guarantee you’ll pop plenty in your mouth while shelling them. Who doesn’t, right? I hope that you enjoy this time of year when you don’t have to feel guilty one bit as you snitch more gelato into your diet! What are your favorite cool sweets to eat this time of year as we get ready for summer? Share with me below! 1 In a food processor or blender coarsely grind the pistachios. 2 In a medium sauce pan over medium low heat, heat the milk and cream until steaming, stirring often. Don't let the mixture boil or the milk will curdle and don't forget to stir often because the milk will burn on the bottom of the pan. 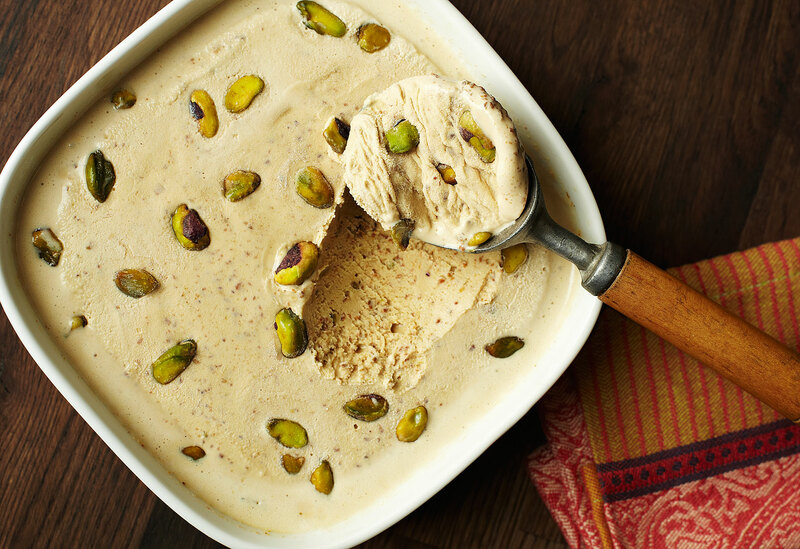 When the milk and cream are very hot, remove from the heat and stir in the ground pistachios and the vanilla. Cover the pan with plastic wrap and refrigerate overnight. 3 The next day drain the pistachio mixture through a fine mesh sieve into a bowl. Use the back of a spoon to really press out the extra moisture left in the pistachio chunks. Discard the pistachio pulp/pieces (or eat it by the spoonful!). Rinse and dry out the pan. Return the milk mixture to the pan. 4 In a separate bowl beat the eggs and the sugar until lighter in color and thick, about 3 to 5 minutes on a medium speed. 5 Heat the milk mixture over medium heat until it is again steaming but not boiling. 6 Carry the bowl of egg yolks and sugar over to the stove and pour just a little of the warm pistachio milk mixture in and stir to combine. Slowly add the rest of the beaten egg yolk mixture to the pan, stirring constantly with a wooden spoon. Cook until the mixture forms a custard that thickly coats the back of your spoon (this will be about 175 to 180 degrees). 7 Cool the gelato mixture completely before processing in an ice cream maker according to the manufacturers directions. 8 Once the gelato has finished churning, quickly place it in an airtight container and freeze for at least 2 hours or until you are ready to serve. Enjoy with a few additional chopped pistachios on top if you like.